“I’m at work and it’s thundering outside. The message is from a friend and dancer in a company I founded twenty years ago. The dance to which she refers is a piece of choreography created seventeen years ago, and recently revived for the company’s 20-year celebration. It is one of several dances that address milestones in my life, and it begins with the rumble of thunder. This one was born of my struggles to retain my identity when I married at the age of 23. Over the years the piece has evolved to incorporate my views on world religions and a yearning for spirituality both rooted in the earth and philosophically engaging. Reviving this piece and planning for a retrospective event celebrating 20 years of Blue Moves Modern Dance Company has given me cause to look back over the history of this group. I laugh, smile and cry as I revisit molding VHS tapes that offer, through the pale medium of low-budget videography and lifeless technology, a picture of the dances this group has performed over the last two decades. My choreography is like a timeline of my life – oh yes, that is when Mary died, and this one was when Ella was born, and I choreographed this one after 911, my second child at my breast, as a protest to the bombing of Afghanistan. How could I possibly know at that age that I would hang on to this company and to the people who made it for two decades? 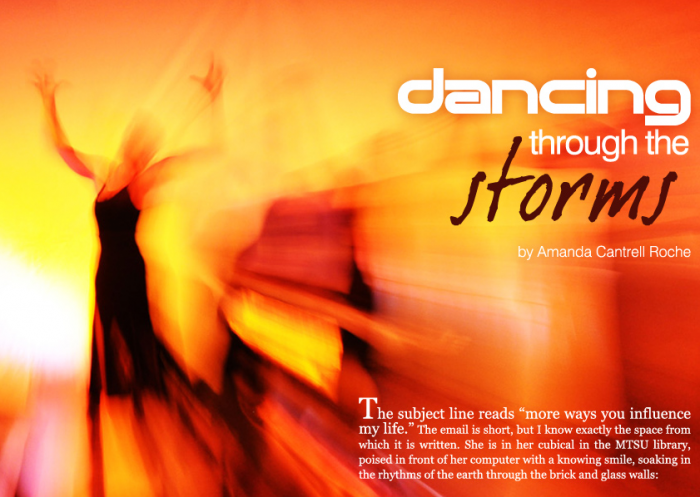 How we would endure through the storms in all of our lives, and use dance to get us through? Choreography is my therapy – the outlet to which I turn when the lightning strikes, when torrents of rain and despair wash over me. It is how I said goodbye to a dear friend who died of breast cancer at the age of 32. How I expressed my grief at the slow, painful passing of my grandmother as Alzheimer’s ate her brain. It was one way in which I acknowledged the horrific but heroic journey through my husband’s cancer diagnosis and treatment, and how I admitted my feelings of, at times, being smothered by motherhood as I nurtured a toddler and carried a child in my womb. And when anger at injustices threatens to burn a hole in me, it is how I continue to rage at human rights abuses in Tibet, in Burma, and throughout the world as people become “the disappeared,” and here in Middle Tennessee, as police abuse their power. We have danced to bring light to wrongs in this world, to help us through loss, to celebrate our blessings, and sometimes just to provoke a smile, a laugh or a nod of understanding. We have become mothers, aunts, and even grandmothers, fathers and uncles. We have endured illness, depression, loss of jobs, divorce, loss of opportunities. We have celebrated graduations, weddings, births, divorces and many accomplishments. We have said goodbye to loved ones, to parents, to children. We have experienced injuries to our instruments; have endured knee surgeries, torn ligaments, slipped discs, shoulder displacement, sprained ankles. We have danced with babies in our wombs, ruptured cysts in our ovaries, with toddlers on our hips, and even along side the woman who holds the title of being the first Blue Moves offspring. We have been there for each other when one of us was in need, we have shared in each others’ joys and pain, danced at each other’s weddings, held each other at funerals. We have had parties to make beaded jewelry, which we hawked like gypsies on the lawn of the MTSU campus to purchase paltry costumes. We have overindulged on Zima, provided in lieu of payment to dance around like fools in 70s costumes at a rave few braved to attend during a February snowstorm. We have forsaken sunny walks in the park on Sunday afternoons to commune together in the dance studio and sometimes, afterwards on summer nights, to drink sangria on the patio of La Siesta, our favorite Mexican restaurant. We have produced shows with no budget, layed out and rolled up Marley floors, hung curtains, swept stages, created choreography, costumes, flyers and cookbooks. We have danced down a two-story escalator twirling silver lame flags at Nashville’s ArtRageous, and performed in back yards, bars and theaters of all sizes. We have never even considered writing bylaws or answering to a board of directors in order to finance our art. We have danced, we have lived, loved and endured, and in the process we have grown into our skins and our souls, and formed a tribe whose story will resonate in us for the rest of our days.